If you've lived here in Texas for any length of time, you know that hailstorms are common. If your car gets caught in one, it doesn't take long before it's riddled with dents due to hail damage. Even if you only see one or two small dents, it's important to have it checked out by a reliable auto body repair shop because there could be unseen damage lurking underneath, and acting smartly and quickly could save you more money on repairs later. If your vehicle suffers hail damage, here are some common-sense tips to help you get things looking like new again. Any dent, no matter how big or small, can compromise the integrity of the finish on your car. In many cases, paintless dent repair is possible, but if the paint has a chance to chip and peel, you'll have to add auto painting to your repair bill. The sooner you get hail damage repaired, the less out-of-pocket expense you're likely to have. Removing dents is not as simple as it seems, and off-the-shelf dent removal kits are inconsistent at best. Unless the dent is removed completely and the paint properly restored, your car won't look like it once did, and it will be more difficult to sell down the road. Always have hail damage repaired by a qualified expert. You see them springing up all the time right after a major hailstorm: tent merchants in mall and grocery store parking lots offering cheap, quick, paintless dent repair. While we can't speak to the quality of any merchant in particular, the fact remains that you run a risk by using an out-of-town service you don't know. By the time you realize the repairs aren't done properly, they've already left town chasing the next hailstorm—not to mention that you now have a car that still shows hail damage. 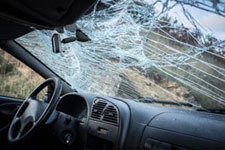 The truth is, proper hail damage repair requires lots of training and expertise, so always take your car to an auto body shop you know and trust—preferably one that employs only I-CAR certified technicians. For reliable auto body and collision repair, trust the experts at Auto Tech Services (ATS) Collision Repair Center. They've been providing excellent workmanship and quality customer service in Mansfield and north Texas for over 15 years, backed by an I-CAR Gold Class rating. For a free estimate on hail damage repairs and other auto body services, they can be reached at (817) 405-3444.